pseudoparanormal: International Flat Earth Research Society? In researching additional pseudoscience topics I came across this organization, the International Flat Earth Research Society. I thought to myself, there cannot be people who still think this after all we know from modern science. Sure enough, there are. Charles Johnson who was the president of this society for nearly 30 years, passed away in 2001, however. They said for his entire life he pushed to help people "recover sanity" by realizing the earth was in fact flat, and not moving. 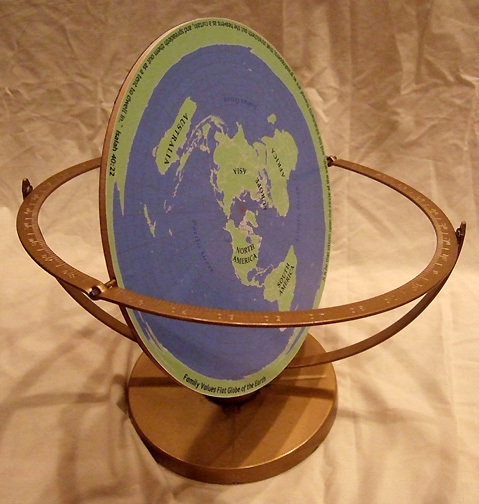 "As shown in a map published by Johnson, the known world is as circular and as flat as a phonograph record. The North Pole is at the center. At the outer edge lies the southern ice, reputed to be a wall 150 feet high; no one has ever crossed it, and therefore what lies beyond is unknown. " "Nobody knows anything about the true shape of the world," he contends. "The known, inhabited world is flat. Just as a guess, I'd say that the dome of heaven is about 4,000 miles away, and the stars are about as far as San Francisco is from Boston." Judging from the previous quote, I assume that he is using this flat earth theory to say to the public that we can not just make assumptions in science, which is a point that I am all for. I feel this relates to the course because it is someone truly believing, to the point of trying to have others believe, something so far out there that it would seem like blatant absurdness to many. Almost similar to a UFO sighting or abductee. Say this was true though, the earth is flat. What does that mean? It would mean its all fake, the stars, space shuttles, the moon landing. Its a far stretch, but he wants people to be shown the flat out facts of how these scientific decisions are made. Oh I don't know about all this! I think that if it was even a possibility we would have heard way more about this society. How could we have pictures of the earth, satellites, etc., if it all wasn't real? This guy has no scientific proof, so if it was true, I would be shocked! This is really interesting.. and I dont know about all this either! If the planet Earth was generally unexplored, then I might take that as a plausible argument. However, we have satellites and spacecrafts that have specifically viewed the Earth to be its circular shape. I want to see the proof of this flat Earth! Interest none the less, and I feel he may just be trying to make a point... to say QUESTION THINGS!! but I do agree with you guys. The most interesting part was he said the outer ring of the flat earth is a huge ice wall no one has ever bothered to try to cross. Did he ever explain how the pictures of the earth are inaccurate if it is in fact flat?